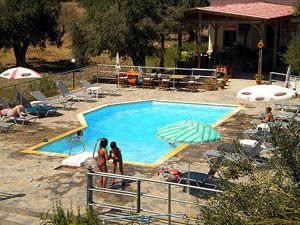 Diamanti Studios & Apartments, is a family business and it is open throughout the year. It is situated in Molyvos in a very small distance from the town centre of Molyvos, constitutes an ideal place for walk – only 10 minutes on foot. big balcons with wonderful view to Molyvos castle, to mountains, to our swimming pool and our big garden which is full with olive oil and other trees and flowers.